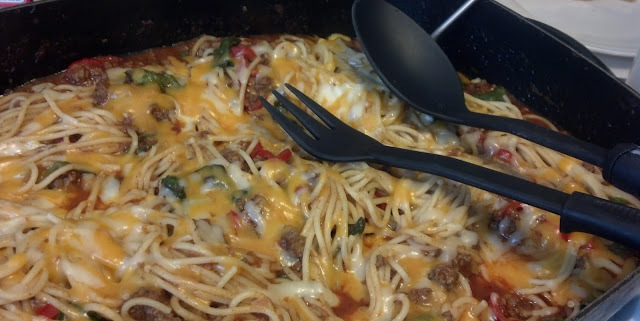 This recipe comes from my friend Betty D. She says ""This is my families favorite". When she was telling my about how her boys just devour it, I asked her to share the recipe so I could share it with you too. Thanks for the recipe it really is good. My kind of meal. Parmesan cheese to sprinkle over individual servings. In a very large skillet fry the first five ingredients together until the veggies have softened and the meat is browned well. Add tomatoes, tomato soup Worcestershire Sauce, sugar, chili, salt and pepper. Simmer for ten minutes. Add the spinach and pasta. Cover with cheese. Close the lid and simmer until the cheese is melted. Pass the Parmesan cheese around for each if they choose. Tip- if you do not have a large skillet. Put the sauce and pasta in a large roaster and bake in the oven. If you are taking this dish to a potluck just a bit more pasta to serve a larger crowd. It does sound like a lot but I double checked, that is the correct amount. Thanks for checking, we have been known to have typos on occasion. Better safe than sorry. There are so many great flavors going on here, I'm thinking it's a good candidate for converting to gluten-free AND vegan. I can leave out the meat and make it vegan, and use my gluten-free pastas as well. Thanks for this recipe. Can't wait to try it! (Tomato soups are generally NOT gluten-free, but I'm thinking I could substitute tomato sauce and it will still be fine). oh this looks so super yum! can't wait to give it a try! This looks great. A change up from my usual white sauce. And oh how I would love a copy of your new cook book! I have shared on pinterest as well as Facebook this morning. I made half of this recipe and it was plenty for three meals for hubby and me. Next time I'll use less Worcestershire sauce as we thought it was quite overpowering. I didn't have zucchini, so left that out, but it was very good.